Chris Lee Jones, 61, of Olathe, passed away on April 1, 2019 at his home. He was born on September 5, 1957 to Earl and Marva (Shaffer) Jones in Fairbanks, Alaska. Chris worked as a Lead Utilities Engineer for Upfield. On October 8, 1976, he married Deborah June Jones (Ahrens). Chris and Deborah lived in Olathe, Kansas. 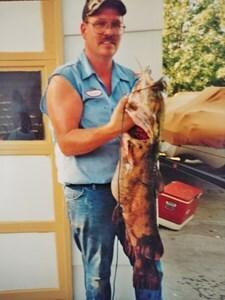 He was a member of operating engineers local 101 and enjoyed family, hunting, fishing, cooking, and working with his hands. Chris is survived by his loving wife, Deborah; daughter, Crystal (Shaun) Stephens; son Matt (Marie) Jones; sisters Patti and Tammy; step-mother, Shirley; 5 step-sisters, 1 step-brother, 1 grandson, and 2 granddaughters. He was preceded in death by his mother, Marva Lou Jones; father, Earl Lee Jones; and sister Linda (Jones) Schahill. A celebration of life will take place on Saturday, April 6, from 4:30 to 7:00PM at the VFW in Lenexa, KS. (VFW 9550 Pflumm Road, Lenexa, KS 66215). Memorials are suggested to the gofundme Chris Jones funeral cost. To leave a special message for the family, press the "Share Memories" button above. Add your memories to the guest book of Chris Jones. Chris was one of those rare individuals who could make you feel like you knew him forever. Most of my memories are from deer camp and hunting on the mountain. He will always be missed but never forgotten. I am saddened to hear of his move to heaven. Smokey is what l called him. And always will. Much love to my stister-in-law, Jonesy, Momma and the rest of the family. Chris and his family welcomed me into their family when my Mom married his Dad. I always felt like I was getting a second big brother. My oldest son always remembers his Uncle Chris teaching him the song. "Beans, Beans the magical fruit, the more you eat the more you toot" Chris is such an amazing man who always put family first. Love you! Praying for all of you! What a great man and how many wonderful memories of him!